Tonight I’m sitting on the floor of the sewing room, eating dinner and reflecting on this space and all that has happened here. 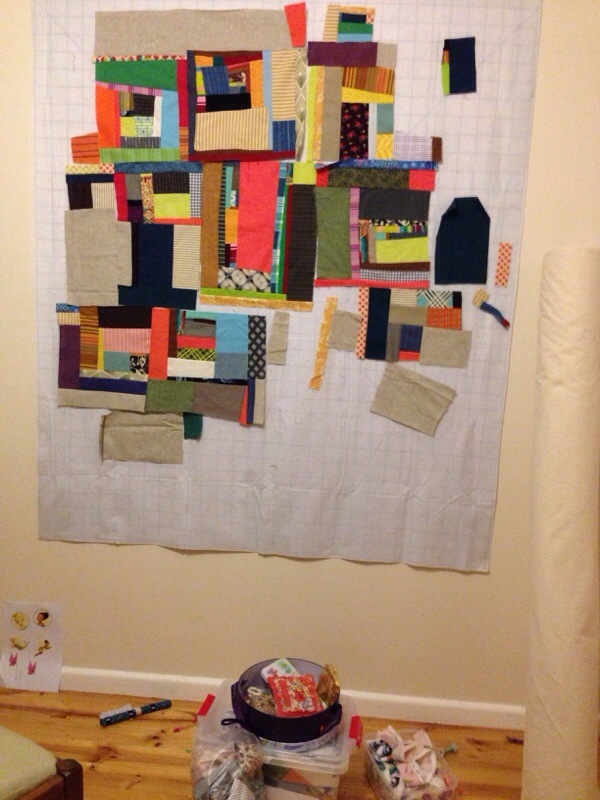 This in progress quilt on the as yet unpacked design wall is the last project I will work on in this home. The home that had housed my husbands family for more than forty years, where his Mum crafted for all those years. Crochet, lacework, quilts, spinning, knitting, cross stitch, tatting, embroidery, dress making. There is a whole lot of creative energy here in this home and I’m finding myself wanting to hold on to it, to pack it up and take it on an adventure. Do you think I can find a way to bottle it? 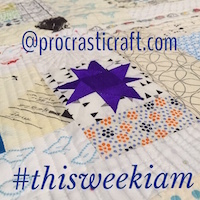 The quilt :: improv blocks started in Denyse Schmidt’s improv piecing class at QuiltCon in February. I’ve finished all the blocks I had fabric for so am going to add yarn dyed Essex linen in natural (purchased from marmalade fabrics, also at QuiltCon) to make up to a queen size for our bed. I’m thinking I might spread the blocks out randomly to make them look almost like they’ve been thrown on the linen. Thoughts on layout gratefully accepted! This entry was posted in Denyse Schmidt, quilt, quiltcon, quilted, quilting, scrap, scrap quilt and tagged improv, moving house, quilt, Quilting on January 2, 2014 by procrasticraft. Do you want some more blocks when I send the linens? I grabbed a number of the orphan blocks and haven’t touched all of them. I can’t remember if I replied or not… Yes please to blocks, that would wonderful. Let me know how much you want for the linens and I’ll paypal it to you. Hopefully I’ll have had some time before our January meeting to work on it and bring it in… Remind me… Have you settled in to your new/old place now? The energy is in you and your memories. Just take the time to stop once and think of them! I love the improve blocks! I think they would look interesting all jumbles in the middle surrounded by the linen, but I like the idea of them randomly placed too! I love this quilt, and I’ve been thinking (for a few minutes) that I’d like to make 2014 an all improv quilt year. Wonder if I could stick to it? But good luck on your packing and move, and yes, you definitely can bottle up that creative feeling of home. You already have in every quilt you’ve made in that space. You’ll feel it whenever you spread them out (on beds, walls and couches) in your new home. so lovely to see those blocks again! I love the idea of scattering them around the linen. I’m so glad we got to make them! It’s taken such a long time to get to them but I think of you each time I look them and remember what fun we had. Mwah!